Tags: Capri, Dark Brown, Heavy, Kameez, Peach. Top: Dark Brown Pure jamawar long shirt embellished with hand embroidery on neckline ,slits and on green appliqued border on hemline in dull gold and peach color. Trouser/shalwar: This Brown dress is paired with brown raw silk matching Capri with embellishment on bottom and sequins spray. Dupatta: Peach pure chiffon dupatta with dark brown banarsi piping and embroidery on edges and floral motifs spray all over. 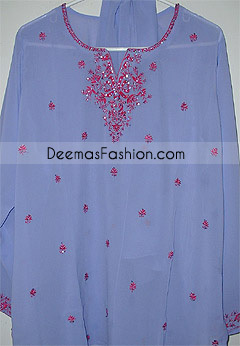 Embellishment work includes Kora/Dabka, tilla sequins and beads work. Peach piping finished on neckline, slits, around sleeves and hemline.